INDIA'S brick industry is the second largest in the world. Since bricks are best produced from alluvial soil, the unorganised industry flourishes in the fertile belt; the Gangetic plain accounts for 65 per cent of the total brick production in the country. But once brick kiln owners wind up operations, the land lies barren and hollowed for almost a decade. This worried botanist Rup Narayan at Ishwar Parsandi College in Uttar Pradesh, who recently studied the impact of brick kilns on the vegetation and agriculture in the outskirts of his city, Bulandshahar. 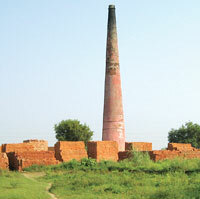 About 300 brick kilns dot the city on the river bank. Along with his student Shachi Gupta, Narayan studied the properties of soil and biomass at three sites: operating brick kiln, abandoned brick kiln and the area lying equidistant from the kilns. This is the first time the ecology of brick kiln area was studied in terms of species diversity and biomass of the plant. The teacher-student duo collected different varieties of shrubs and herbs from the sites. "The kiln areas were full of burned soil. There was no vegetation within 15 metres of the main heat area," said Narayan. The researchers washed the plants within 24 hours of uprooting and separated different species. Each portion was dried at 80oC for 48 hours and then weighed to measure their total mass, or biomass. They found biomass of the shrubs from operating and abandoned brick kiln sites were much below their ideal weight, indicating that constant heat from brick kilns had reduced the soil into a stressed habitat, killing the organic matter and microbes needed for plant growth. Soil testing showed vital soil nutrients, such as carbon and nitrogen, had also reduced drastically. "If the brick kilns have created a stressed environment for weeds, one can think about their impact on crops," said Narayan. The plants that are able to adapt to the stressed soil conditions of the brick kiln area survive. A grass, Saccharum munja, which has more extensive root system now dominates abandoned brick kiln sites, the researchers noted in Current Sciences on July 10. "The soil degraded by brick kilns requires extra tilling, manure and fertilizers. Even then we are not sure if the yield would be good," said P P S Pangli, chairperson of Punjab Kisan Club. R P Narwal, senior soil scientist at Choudhary Charan Singh Haryana Agricultural University, shares concerns of Narayan and Pangli. In India, the best soil is being used for making bricks. The government should restrict the use of fertile soil for making bricks, Narwal added.